Good or bad, habits are hard to break. Try refraining from showering for a week – or even a day – to see what I mean! As the old song by Chicago goes, habits can be hard to break. Especially addictive ones like smoking, binge drinking, or lazing on the couch. 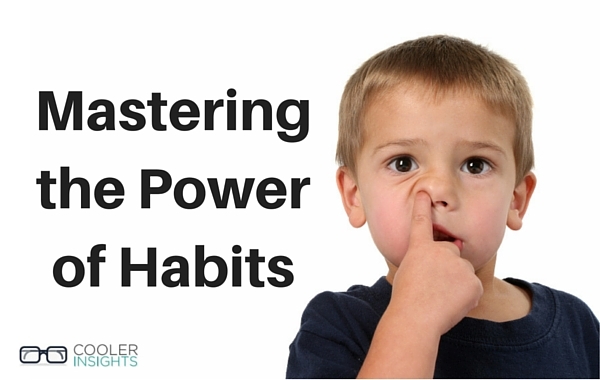 What can you do to break those bad habits so that you can lead a healthier, happier and more productive life? How can you convince your customers to switch to your brand by changing their habits? Rewards: The positive outcomes (ie real or perceived payback) of habits which reinforces our behaviours. 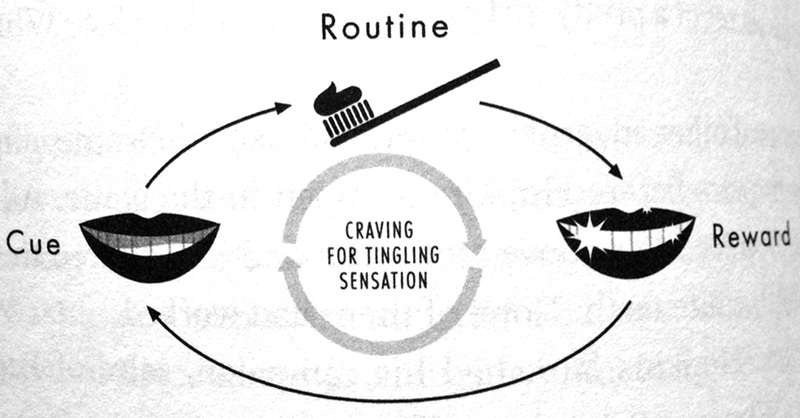 To illustrate these factors, consider for a moment the act of brushing teeth. According to Duhigg, advertising pioneer Claude Hopkins in the early 1900s cleverly associated the film on one’s teeth as a “cue” for consumers to brush their teeth so that they can remove this “dirty” coating. Inventor of the Pepsodent toothpaste, Hopkins further created a special recipe with mint extract which made one’s tongue and gums tingle. Apparently, the shiny smooth tooth surfaces (as felt by one’s tongue) and tingling sensation make up the “reward” of using toothpaste to clean one’s teeth. They make us feel that our teeth is clean even though the minty taste has nothing to do with the effectiveness of the toothpaste! Over time, this forms part of our daily “routine” – and a fairly addictive one I might add. The pairing of simple and obvious cues with immediate rewards are also found in shampoos. Contrary to popular belief, your shampoo’s foams and suds doesn’t really do anything to clean your hair. However, they certainly make you perceive and believe so. Such cues can also be found in the Kaboom bathroom cleaner, which lightens from blue to white after you’ve sprayed it on your sink for some time. The colour change simulates a cue for cleansing action, even though it exerts no influence on the process. 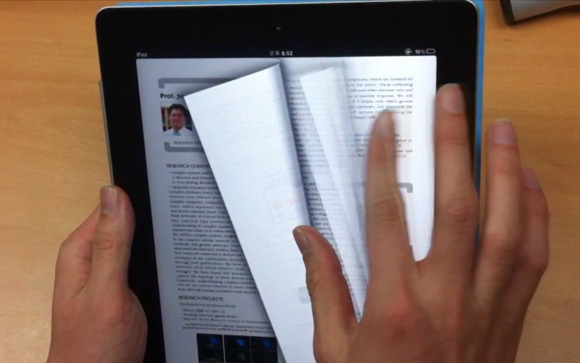 In the same vein, Apple incorporated the turning of pages on an iPad e-book to mimic an actual book even though there is limited utility to the feature. The lesson here is that people need to know that something is happening when they use your product. That “something” can be an addictive habit learned through years of use. It can be as banal as the visual effect of “opening” an application on a computer, or hearing the “pop” sound of a newly opened jar of mayonnaise. The next thing you should note is what Duhigg calls the Science of Small Wins. Popularised by management guru Tom Peters (check out his wonderful list of 163 small wins here), the basic idea here is to create habits that provide small opportunities for victories. These in turn can be positively reinforced through repeat practice. 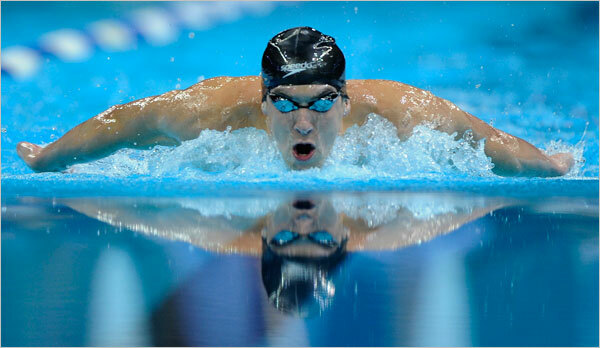 An example of small wins is seen in Olympian swimmer Michael Phelps’ daily routine. Every day, he would perform the same exact ritual – waking up at the same time, eating a certain breakfast, going on small practice drills and so on. Everything goes according to his coach’s plan. This series of small victories reduced the stresses of the actual race, which will then be perceived as yet another victory. Small wins allow serendipity to happen. The goal is to try something and test to see if it succeeds. Doing so allows one to conduct small costless experiments in a non linear fashion. You can adopt the same principle with your customers and employees. Create opportunities for them to achieve small results as fans. Develop cues that trigger desired actions. Hopefully, these rewards will influence their brain to welcome tasks that eventually become a part of their regular routines. More examples of small rewards can be seen in the step by step check out process on Amazon. Research shows that customers who complete each stage get a tiny shot of dopamine (a feel good hormone) through their system. This mini sense of accomplishment becomes an addiction that culminates in an online shopping habit. As we’d imagine, Starbucks is a master in cultivating habits. Beyond the natural addiction of caffeine, the global coffee chain dishes out appreciation cards for all its employees to thank each other every day. While these cards do not offer anything tangible, they are viewed as small wins that are treasured by crew members. Similarly, yelling your name out loud also gives you a jolt of recognition when you collect your dose of overpriced coffee. Yes, that’s another reward – albeit a small one. Explain to them why it won’t happen again. In this case, the “reward” which Starbucks’ baristas enjoy from this “habit” is a customer who stops screaming! Finally, Duhigg shared that any habit can be changed. Change the routine when the cue appears so that you get the same reward. For the Golden Rule to work, you need to believe that you can change your habits and that things will get better. Often changing one’s habit is easier within a community. Publicly declaring that you will change your habit and getting your friends or family members to hold you accountable for it helps tremendously too. 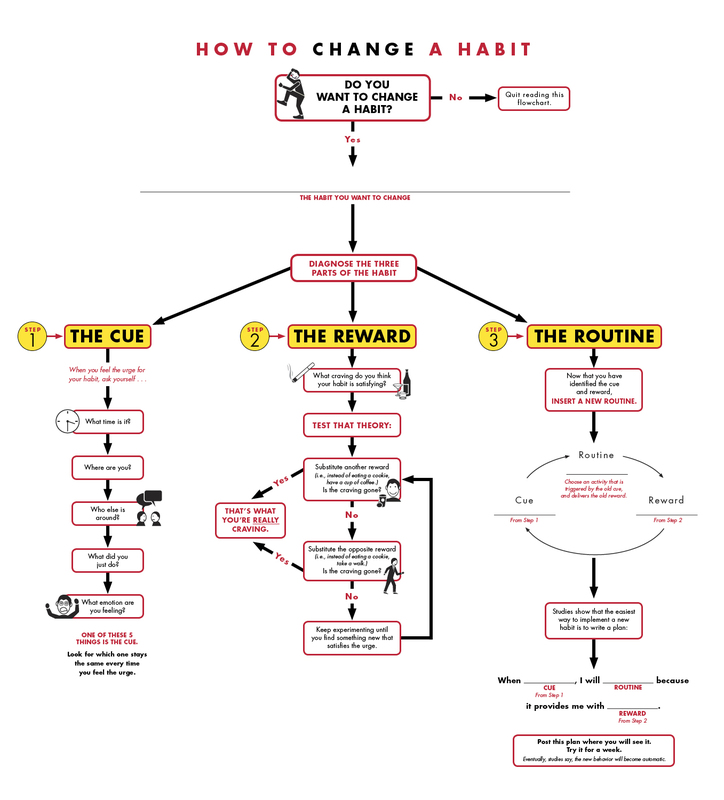 Check out this handy flowchart below (larger version here) to learn how you can master your own habits. To better understand how you can change your customer’s habits, let us look at this example from The Four Hour Life. 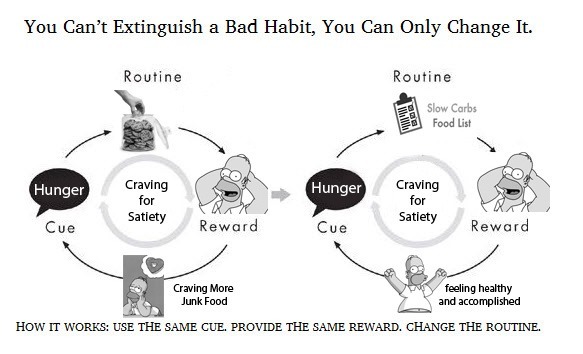 The main principle here is to use the same cue (hunger or mealtime cues), provide the same reward (feeling full and satisfied), but change the routine. In this case, it would be the habit of eating. Include the Cue, Routine, and Reward cycle. You may also wish to highlight the Craving for your customers, and incorporate statements of Belief. Habit: From tasty and addictive junk food to healthy yet satisfying and tasty foods. Reward: Feeling of satiety, enjoyment of food. Belief: From “I cannot control my diet or my lifestyle” to “I believe that I can be healthy and vibrant. Remember to keep the Cue and Reward in your habit changing process. This requires you to communicate the benefits of a new dietary regime to your target customer. You can reinforce this with testimonials, awards, scientific research and other evidences showcasing the benefits of healthier food. Emotional messaging (eg a healthier body makes you more attractive) could also be applied too. Once this messaging is done, you need to constantly reinforce the new craving. Expand it in your customer’s mind as much as possible, in order to replace the earlier craving of taste. This could be done by continually communicating with your customer on his or her “new self” and enlist him or her in your community so that there is greater public accountability. Ready to change your customer’s habits? 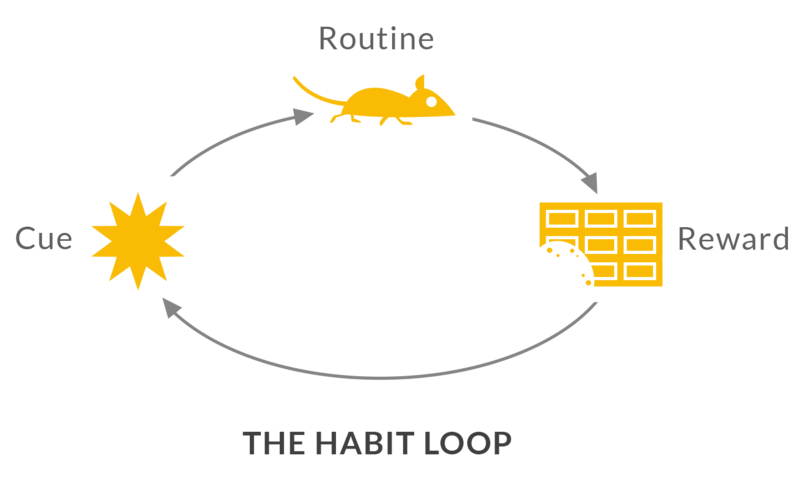 As marketers, it is important for us to understand how habits are formed. Doing so allows us to achieve a greater probability of success when changing customer behaviours. On a personal level, understanding how habits are formed and broken is also useful for us to break free of negative behaviours while embracing positive ones. For more, check out the short video below of Charles Duhigg in action.